I was so excited for the weekend to start today that I left the office without prepping my snack. Well that and I wasn’t actually hungry. No worries, I brought it with me in the car. 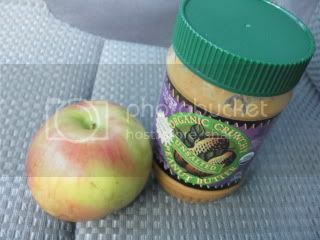 Now, I know you are wondering who I managed to get my pb on my apple. Being the pack rat that I am, I actually had a plastic knife in my middle bin that I got from Starbuck’s awhile back. 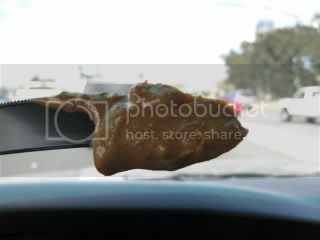 I quickly whipped it out and scooped out my 1 TEASPOON of Peanut Butter. Have you all ever wondered how LITTE this amount of pb is? When I came home, suddenly my body realized it was hungry *sigh* I tried to just pretend it wasn’t there and sipped on some fizzy water. However, after we drove all over the place running some errands and came back, I found myself digging into The Husband’s latest sample ~ Mr. Krispers Nacho Cheese! WOW ~ I LOVE this flavor – surprisingly better than BBQ and I am a total BBQ kind of girl. I stopped myself at 3 and backed away from the dish….I needed to focus on my Bikini Bootcamp approved snacks. 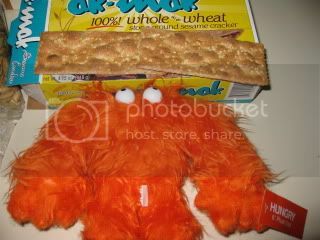 So, I whipped out another one of my Secret Bloggie’s gifts – Ak Mak Crackers. You can have 3 high fiber crackers for snack so I am all about picking the biggest ones I can find!! I LOVED these crackers ~ they are crispy, but, light, not hard and have a nice sesame wheaty tasty. Thanks ~ ChickPea – another rockin’ treat. I am definitely saving the rest for laughing cow and apricot preserves – YUM! I have been lookinig forward to THIS dinner all week. I started off with a fabulous Clear Chicken Broth heated up with a chopped jalepeno. 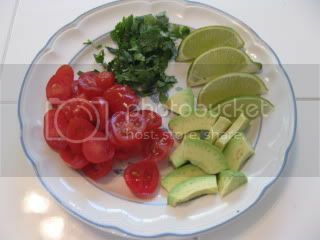 While that cooked, I prepared the plate of toppings. The soup wasn’t bad, but, nothing that would really fill you up. I liked how it was spicy and I LOVED the AVOCADO! 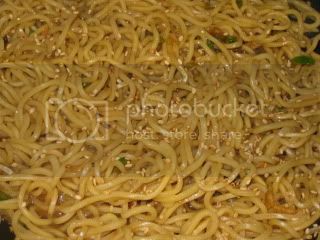 I LOVE these noodles as my favorite healthy chow mein substitute so I knew they would work for this. I don’t use the sauce pack that is provided…instead, I whipped up the Bikini Bootcamp Marinade to use on the noodles and the fish. 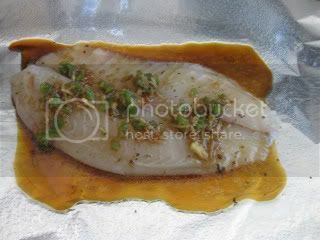 I sprayed a sheet of foil with nonstick spray and placed my tilapia on it. I topped it with a few teaspoons of the above marinade. I put it on the grill to cook (top rack) for about 10 minutes while I prepped the noodles. 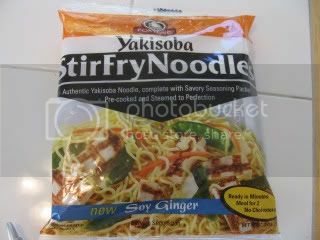 You simple put a hole in the noodle bag, microwave for 1 minute to loosen and toss then in a nonstick pan with 1/2 a cup of water to cook. I cooked them until the water was gone and then added some, but, not all of the marinade above cooking it for about 2 minutes or until most of the marinade had been absorbed. Top them with some toasted sesame seeds and they are done. 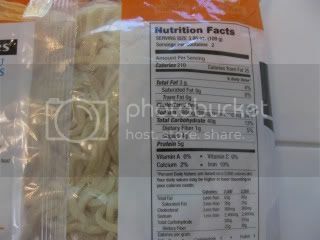 I topped my sesame noodles (1/2 the bag!) with the fish. 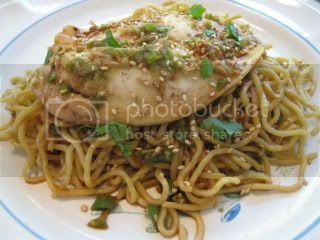 I spooned a few additional teaspoons over the top and topped everything with roasted sesame seeds and a little cilantro. While The Husband did the dishes ( LOVE him! ), I prepared dessert – I am ALL over having this dessert tonight. It tastes just like pineapple upside down cake!!! Heat the the juice, brown sugar and extract in a sauce pan over medium low heat for about 15 minutes or until the sauce is reduced in half. 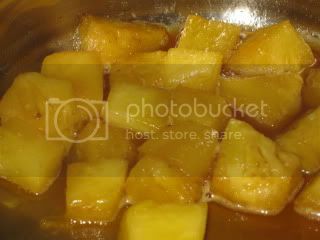 Add the pineapple and cook for 5 additional minutes. It is now cooling on the stove and I cannot wait to have it. Even better thought ~ Can you imagine this over some vanilla FroYo?! OMG….must try…..
Alright all, I am off to relax and watch movies with The Husband ~ Yeah! Ohhhh….My Secret Bloggie, Matt, got his package today. Now I can share with you all what I put together. Click HERE to check it out! My Mr. Krispers contest is about to END…..have you entered all the times you can? If not, be sure to click HERE to check it out! Nite all ~ catch ya manana! OMG your dinner looks delicious!!!!! 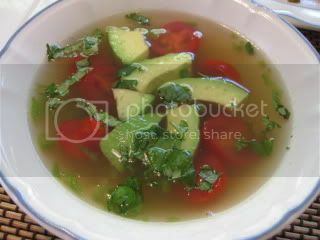 I am wondering if you could blend the soup and get a creamy type soup because of the avocados? The krisps sound delicious, and I LOVE your dinner! Those fish and noodles combo is genius. The pineapple sounds so sweet and delicious, too. Yum! Oooh, looks like a great dinner! I really want to start incorporating more fish into my diet, and this looks like a great recipe! C.G ~ Ohhhh, that's a great idea to puree it – I bet that would've made it alot better! Janetha ~ It hurts my tongue if I eat too much of the raw stuff – cooked, it wasn't too bad. 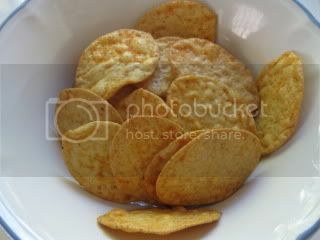 Anne ~ The crisps are super good and addicting for sure. Dinner and dessert was awesome. Thanks I hope you had an awesome Saturday too. Emily ~ it was a really fast and easy recipe – I highly recommend it.